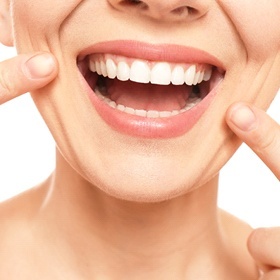 Have you ever wanted to get your teeth straightened but didn't want to wear wires and brackets for two to three years? If so, Invisalign® may be a great solution for you. We'll begin with a comprehensive exam. Everything from the general health of your teeth to crowding and root health will be examined. 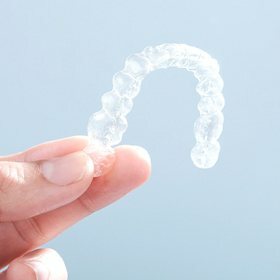 If you are a candidate for Invisalign, we'll then take a mold of your mouth. This will then be sent to an Invisalign® lab where they’ll use a sophisticated computer program to design and manufacture a set of aligners that will straighten your teeth in about half the time of traditional braces. When you get your first pair of aligners, you'll notice they don't quite fit. That is intentional. The aligners gently guide your teeth into the proper alignment. In a few days, the aligners will fit naturally, and after about two weeks, it will be time for the next set. In about six months to a year, you'll have the straight smile you've always wanted— all without anyone even knowing you were doing it! No one will be able to tell you are wearing braces. From a normal conversational distance, they are truly invisible. You can eat anything you want. Simply remove the aligners before meals and replace them afterward. You'll never have to worry about food getting stuck in your braces. Your oral hygiene will be a snap. You can brush and floss normally. Simply remove the aligners when it's time to brush your teeth. Your teeth will be straightened in about half the time of traditional braces. 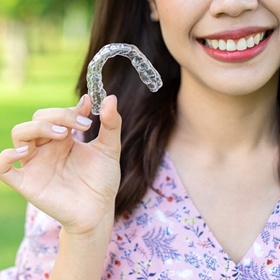 While normal wire and bracket braces may take between two to three years to straighten your teeth, Invisalign can accomplish the same thing in about six months to a year. They are much more comfortable than traditional braces— nothing to poke at you and irritate the inside of your mouth. They require patient compliance. Because the aligners can be removed by the patient, sometimes they don't work for teenagers or children who could lose them. 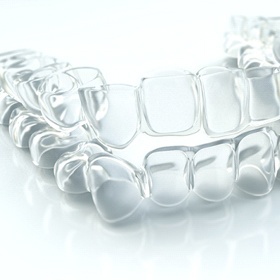 Because of the lab fees, Invisalign® is slightly more expensive than traditional braces. Most people with slight-to-moderate crowding and teeth that are fully erupted are good candidates for Invisalign®. If you would like to ask Dr. Swearingen if you are a qualified candidate, we'd be happy to set up a complimentary consultation. Invisalign® patients have a high level of satisfaction. Nine out of ten patients recommend it to others. If you'd like to get started straightening your teeth discreetly, you can call our office at 405-751-8092 to schedule an appointment, or you can click here to request an appointment online.